The Horror Movie BBQ: Celebrating Wizard Wednesday with Ross of 8-Bit Zombie! Celebrating Wizard Wednesday with Ross of 8-Bit Zombie! If you've liked the HorrorMovieBBQ on Facebook, you've already seen that I have started "Wizard Wednesday", a day where I celebrate one of my favorite movies of all time, The Wizard! It's a day where I try my best to spread the word of this unusual movie in hopes more people either discover it for the first time or maybe rediscover their love for it. It's a fun day that I look forward to every week. Now, what do I normally do on #WizardWednesday? Normally, I post a screencap, a piece of merch, some trivia, a video, anything I can find that may have ties to this movie. One of the things I've wanted to do was try my hardest to get a hold of some cast members, maybe the director, whoever I could that could give me a few moments to discuss The Wizard. Now, obviously Christian Slater was out of the question, but I'd love to get a hold of everybody one way or the other! One person I needed to reach out to was Ross. Who's Ross? Why the mastermind artist behind 8-Bit Zombie. Now what is 8-Bit Zombie? For shame! You should know this! 8-Bit Zombie is some of the most radical nostalgic art and clothing you can find anywhere in the world! Are you a fan of Masters of the Universe, Lost Boys, Garbage Pail Kids, Nintendo and skateboarding? Sure you are! Then this is your one stop shop! Ross puts a lot of love and effort into these creations and it shows how much of a fan of these properties he is. All you need to do is head to his store and discover his amazing goods! Shirts, caps, hoodies, even toys! And of course you certainly can't order something without ordering yourself a Trash Bag(stickers, a poster, cards and a pin or two!)! This stuff is downright amazing and I have zero shame wallpapering my office in these beauties! So with that said, Ross was kind enough to take a few moments to discuss his love of the Wizard, Thrashing, and some other cool stuff! 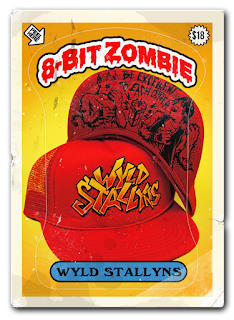 Seeing as it is indeed #WizardWednesday and you're the creator of 8-Bit Zombie, I must ask, how much influence did this movie have on your creating the logo(or concept) of 8BZ? It was a definitely a big influence and was one of the first movies I referenced with the brand. That film holds a special place in my heart. I actually saw it in the theater as a kid. All the kids in the theater (Including me) lost their collective minds when the Mario 3 footage popped up on screen, haha. It was amazing. 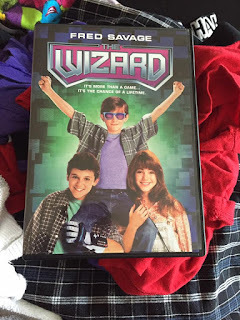 The Wizard, maybe more than any other movie, really represents what 8BZ is all about: 80’s movies, video games and general nostalgia / pop culture. It really has it all! As for the logo, it also definitely had an influence there. I remember that my artist bud, Matt Skiff and I, were brainstorming ideas for a logo. The Power Glove actually wasn’t the first direction we went in, there were NES carts, controllers, etc. But once the Power Glove popped up, it was a no-brainer. Your Lucas art(can I have those two words in the same sentence and not get sued?) is one of the most popular design it seems amongst fans. Thoughts on that shirt/print, looking back? Any possibility of that design or any Wizard designs coming back? I still love that design! Again, the amazing Matt Skiff is to thank for the radness there. It turned out perfect and was pretty much exactly what I had in my head when I pitched the idea to him. I think about brining that one back often. I would also love to do an updated version. As for new Wizard gear, most definitely! I’ve already got some new artwork made and I want to do even more with that movie this year. There’s just SO much potential with that one. 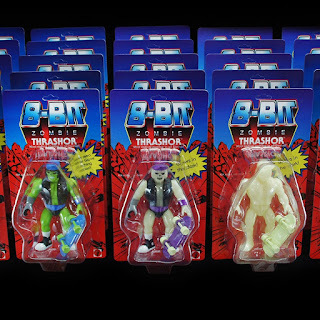 Your original creation of Thrashor seem to be highly popular amongst fans and collectors. Where did the concept of Thrashor come from? Much like a real 80’s character, Thrashor has a pretty interesting, and somewhat strange origin story. It all started with the idea to do a MOTU themed tee. He-Man, Skeletor and the whole MOTU universe is one of my huge loves. But for this project, I wanted to create an original character. And the initial idea was to do a tee design of just an action figure. I took that idea to Matt Skiff (Seeing a pattern here yet? Haha) and he was just as excited about it as I was. So we started tossing ideas around. As I researched existing MOTU toys & characters, I realized just how much I loved the packaging too. 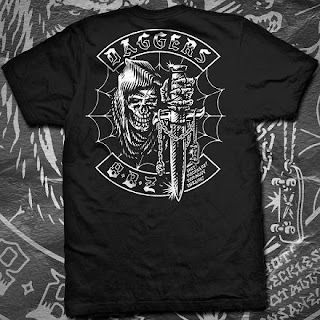 That’s when I got the idea to incorporate the packaging into the actual tee design. Matt was on board and things took off. The design was a hit and would start us on the path to a whole series of “toy package parody” tees. 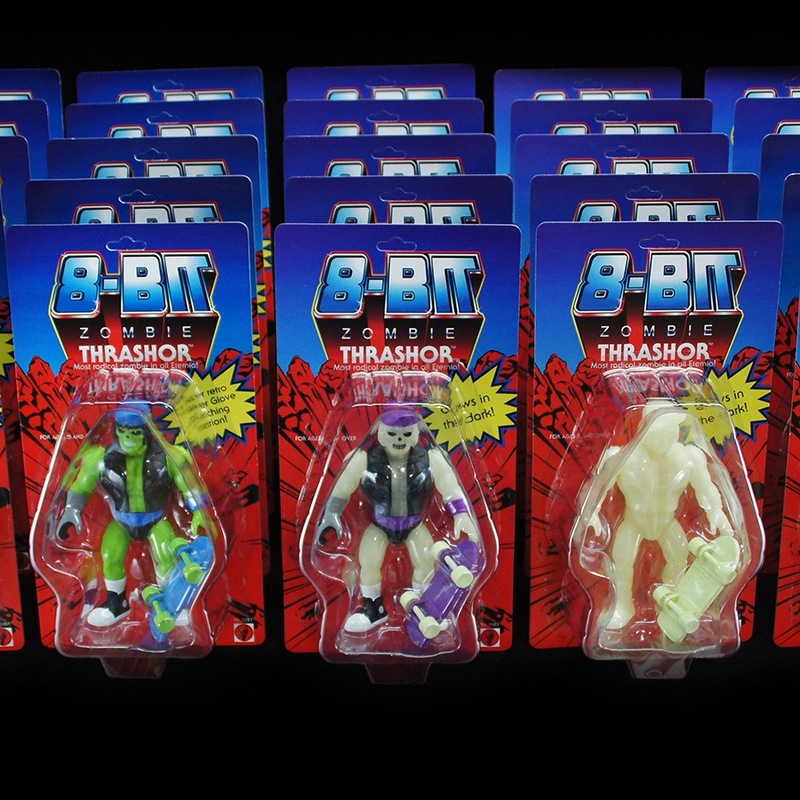 Matt and I often joked about making Thrashor into a real toy but little did either of us know that in the near future, that very thing would happen! I was lucky enough to get in touch with the fine folks at Shinbone Creative and they guided Thrashor from a 2D tee design into a real life, 3D toy. It’s one of my favorite 8BZ projects ever and remains one of the things I am most proud of. Being an 80’s kid and an 80’s toy collector, creating my very own action figure was definitely a dream come true. The lunchboxes are another one of my favorite things too. So hard to pick a favorite box though, I really don’t think I can choose! 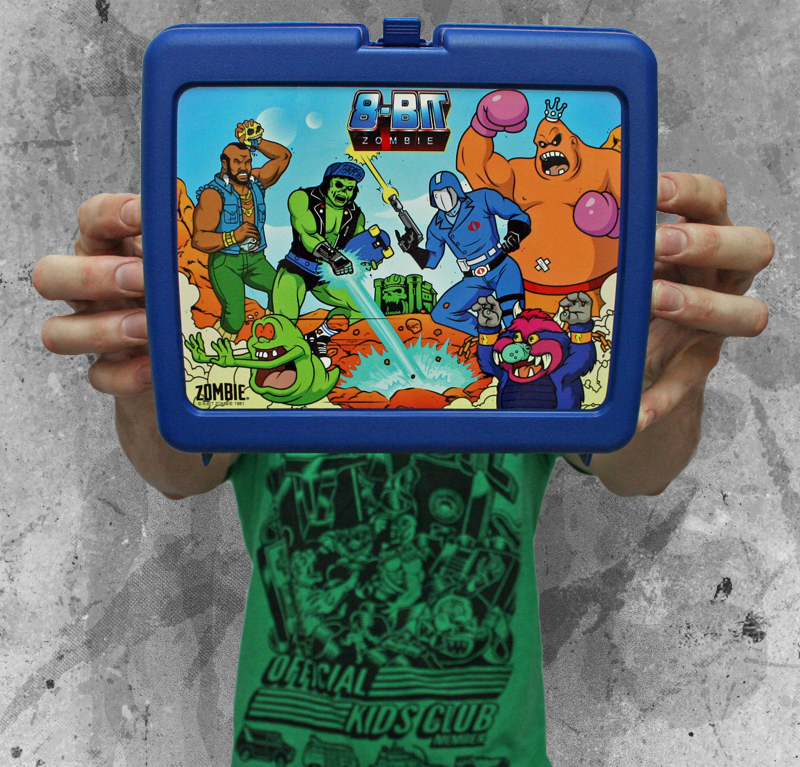 But I agree with your choice, that first lunchbox design does hold a special place in my heart as well. As for new lunchboxes, sadly it doesn’t look too good right now. By the time I had the idea to do mine (About 5 years ago now) Thermos had already stopped making plastic lunchboxes. 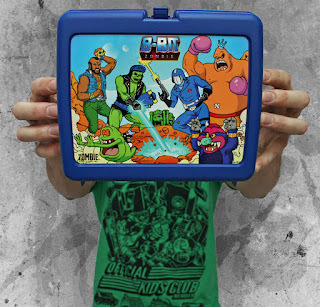 They were the last hold-out and I’m sad to say that old school plastic lunchboxes are now pretty much a thing of the past. Gone the way of the VHS tape and Saturdaymorning cartoons. Pretty sad, really. Luckily, after months of searching, I managed to track down some old stock. And that in itself was pretty much a miracle! But after 5 different lunchboxes, I’ve run through the entire secret stash. I’m always on the hunt for a new source though. Currently looking into a possible supplier, so fingers crossed! We’ll see what happens. Just like the Goonies, I never say die. I've noticed a lot of Thrashin' love in your products, does that film hold a special place for you? Definitely! 80’s skateboarding culture in general has always fascinated me. I was too young to be into it, in it’s heyday. But my older brother was a skater, so in my eyes, him and his friends were the coolest. They all had Tony Hawk bangs, neon clothes and rad boards. It was absolutely a huge influence on me. Thrashin’, definitely brings back those memories. The 80’s skateboarding scene has a special, over-the-top, cheesy-charm, that is just so amazing. And movies like Thrashin’ and Gleaming The Cube, captured that perfectly. Is there a character/series/actor you'd like to do but haven't gotten the chance to yet? So, SO many. My problem is that I have WAY too many ideas and not enough time or money to make it all happen, haha. I would have absolutely no problem churning out stuff for many years to come. In my eyes, I’ve only barely scratched the surface. I can only hope 8BZ will be around long enough for me to get to all the stuff I still REALLY want to do. A lot of your art can be described as homages, have any actors or personalities that you've featured sent you a message regarding them? Not really, haha. I know Alex Winter has seen and approved of the Wyld Stallyns hats. But other than that, I’m pretty far under the radar, I think. I’m still very much a little guy in the world of online brands. Finally, is the Power Glove really bad or is Lucas just being a tacky salesman? It’s SO bad! People always like to bring up the fact that, as an actual game conTroller, it was pretty much a failure. But that means absolutely nothing to me. It was so far ahead of it’s time. And it looks so very rad. There was and still is, nothing else like it. There are certain inventions/creations that not only encapsulate the era in which they are created, but also change the landscape. And I think the Power Glove is one of those things. It was innovative, iconic and it’s radical to the max. I’m proud to use it as a symbol for my brand. I can't thank Ross enough for stopping by and hanging out for a few minutes! As you can see from this interview, he is what a geek should personify: excitement, passion and love. And if you still are not convinced, head over to his store, pick up an item or two or thirty. I'm wearing my Lucas Barton shirt as I type this! YAS KWEEN! Only pack the essentials: Clean Underwear, shirts, pants and the Wizard on dvd! 5 VHS For A Great Saturday!